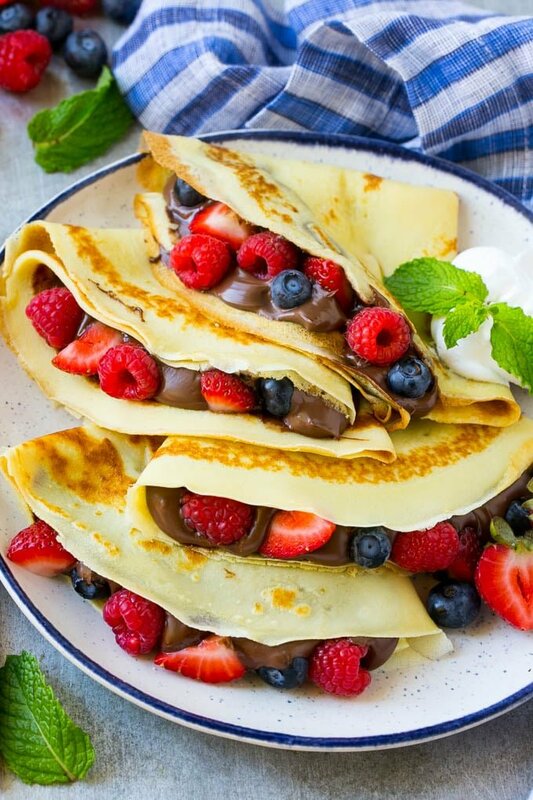 These nutella crepes are a foolproof recipe for blender crepes filled with nutella and fresh berries. Perfect for a weekend brunch! 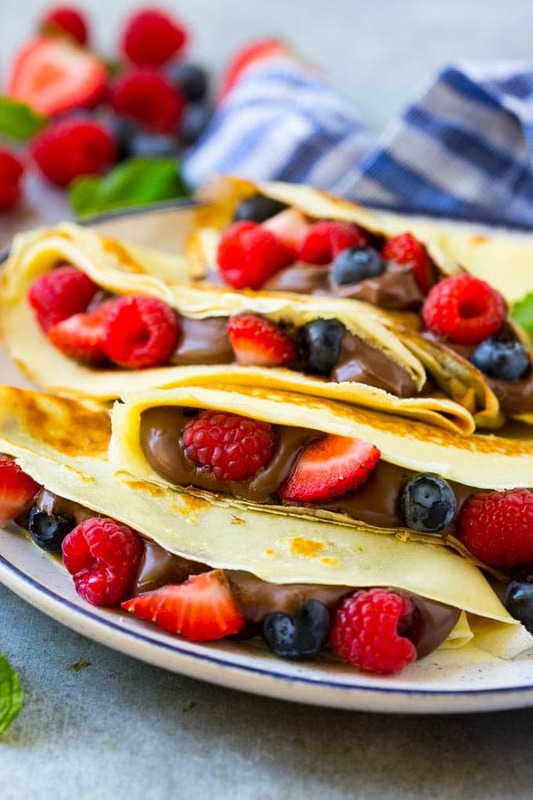 These crepes are sweet and delicious with nutella and berries. For a savory dish to go with the nutella crepes try a breakfast casserole with bacon or ham and egg cups. I happen to adore crepes – they’re light, delicious and the filling choices are endless. These nutella crepes are my very favorite, I make them at least once a month and my kids go crazy over them! How Do You Make Nutella Crepes? My go-to crepe recipe is actually made in the blender, it’s basically fool proof. The batter can even be made earlier in the day, just stir it well before you use it. When making crepes, the trick is to use just enough batter to cover the bottom of the pan and work quickly to make sure the batter spreads evenly before it starts to solidify. I folded these crepes into triangles, stuffed them with nutella and added lots of fresh berries. 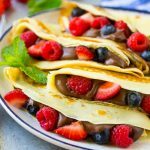 I can’t decide if I prefer these nutella crepes for breakfast, brunch or dessert, they’re amazing either way! You can never go wrong with berries and chocolate, and a dollop of whipped cream is the perfect finishing touch. You can use whatever combination of berries that you want, or even swap out the berries for something like bananas – it’s totally up to you! 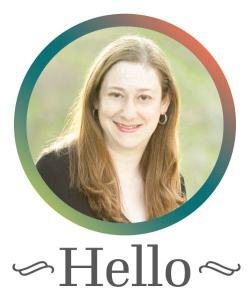 This post was originally published on August 27, 2015 and was updated on July 28, 2017 with new photos. 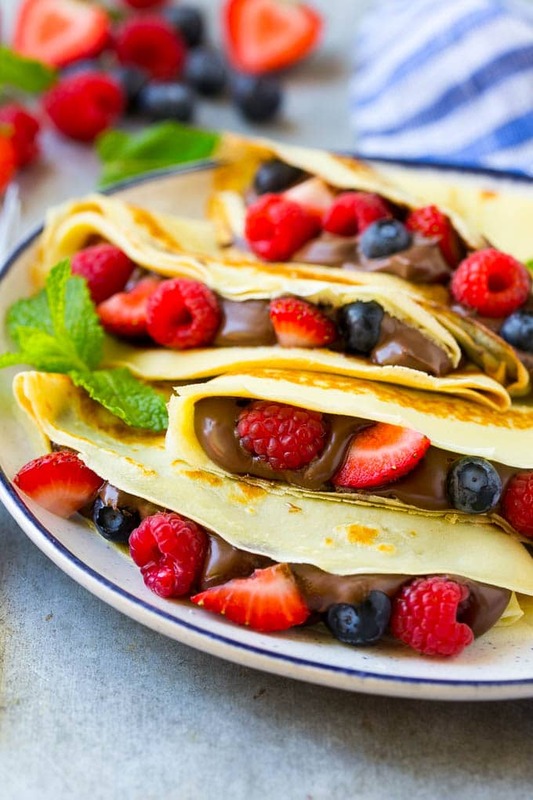 These nutella berry crepes are a foolproof recipe for blender crepes stuffed with nutella and fresh berries. Crepe recipe adapted from Martha Stewart. Pour flour, sugar, salt, milk, eggs, and 3 tablespoons melted butter into a blender. Puree until mixture is smooth, about 30 seconds. Let batter sit for 15 minutes before you use it. Heat a 12-inch nonstick skillet on medium heat. Lightly coat with additional butter. Add scant 1/3 cup batter and swirl to completely cover bottom of skillet. Cook until underside of crepe is golden brown, 2-3 minutes. Loosen edge of crepe with a spatula, then with your fingertips, quickly flip. Cook 1 minute more. Slide crepe out of skillet and repeat with remaining batter. Spread 1 1/2 tablespoons of nutella over each crepe and add a sprinkling of berries. Fold each crepe into a triangle. Top with a dollop of whipped cream and serve immediately. Garnish with mint if desired. Make Ahead: The crepe batter can be made earlier in the day and stored in the fridge. Mix it well before use. These crepes are seriously beautiful! Love the nutella addition! I’ve never tried yellow raspberries before! Do they taste the same as red? Doesn’t matter either way because these crepes look amazing! They taste exactly the same, just a fun color! I am raspberry obsessed and somehow have never tried the yellow ones..I have never seen them before! I am gonna be on the look out for them! These crepes are truly gorgeous!! Pinned! I need one of these crepes in my life. And yellow raspberries? What?! I had never seen a yellow raspberry before and now I can say I have! I’ll have a handful of those right on top of a big dollop of that whipped cream, mmkay? Looks so good! Those yellow raspberries are gorgeous – I love that they inspired these crepes. They sound delicious! love crepes and usually have a hard time deciding between savory and sweet additions. This looks AMAZING! Perfect for a family sunday morning breakfast! The prettiest crepes I have ever seen! Nutella Berry Crepes!!! My dream come true! Looks so yummy! I love crepes and these look SO good! I love the make ahead, easy crepe recipe — so many things you can do with crepes and the photos you took make everything look delectable! I’ll be making these for sure. Cheers! Truly one of my favorite desserts yet haven’t tried with yellow and red raspberries. The dish looks so beautiful!